History: (What If I#17 (fb)) - Upon recieving news that their motorcycle show would get to perform at Madison Square Garden, Crash Simpson told Johnny Blaze that he had cancer and the doctors do not expect him to live for a month. Desperate, Blaze summoned Satan and pledged his soul to the demon if he allowed Crash to live to see his dreams come to fruition. The demon accepted. Crash performed successfully at the show, but afterward Johnny became distant. Later, the demon appeared to Johnny demanding he surrender his soul, but Johnny tried to refuse. Hearing the argument Crash entered Johnny's room and found the Ghost Rider therein. Crash fled, but was swiftly killed by Ghost Rider. Seeing that Roxanne had witnessed this, Blaze regained some control of the Ghost Rider and took his motorcycle and left. Roxanne realized that the demon was Johnny and began tracking him across the country by following police reports, intent on getting revenge. Avoiding the police, Ghost Rider rode to the State Penitentiary in New Mexico where he found convict Chill Miller and an accomplice escaping from jail. As he killed the two criminals, Roxanne arrived. Ghost Rider told her that Blaze was gone now and she replied that was one more thing she needed to get revenge for. She attacked and the Ghost Rider incinerated her. Ghost Rider left to continue his mission to collect souls for Satan. (What If I#17) - In the desert Daimon Hellstrom confronted the Ghost Rider. Ghost Rider claimed that his was a mission of justice, but Daimon forced him to remember the innocents killed during that mission, Crash and Roxanne. 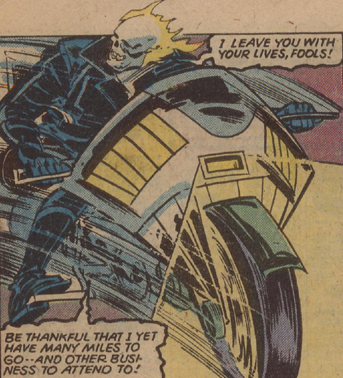 Moved by these memories, Ghost Rider shed a tear, which convinced Daimon that some remnant of Johnny Blaze's soul still existed in the demon, but Ghost Rider denied this and attacked. Daimon removed all the Hellfire from Ghost Rider, reducing him to a skeleton which could not move laying on the desert sands. In the Marvel Universe, I do believe that when Blaze summoned Satan he got Mephisto. That isn't stated here, and Daimon does refer to the Satan involved as his father on a few occasions, so perhaps it was that other Satan, Marduk Kurios in this reality who granted Blaze's wish. For other possible Satans, check this out. Going by the traditional year/month process, this would be Earth-789.